Today I caught up with an old school friend who I haven't seen for 17 years. How am I possibly that old?? It was a good catch up (despite the toddler's best efforts to decorate the entire venue with sultanas) and it made me think of a photo I had kicking around of the two of us, taken on my 15th birthday, 16th October, 1993 in the front yard of our house at Wirrabara, South Australia. 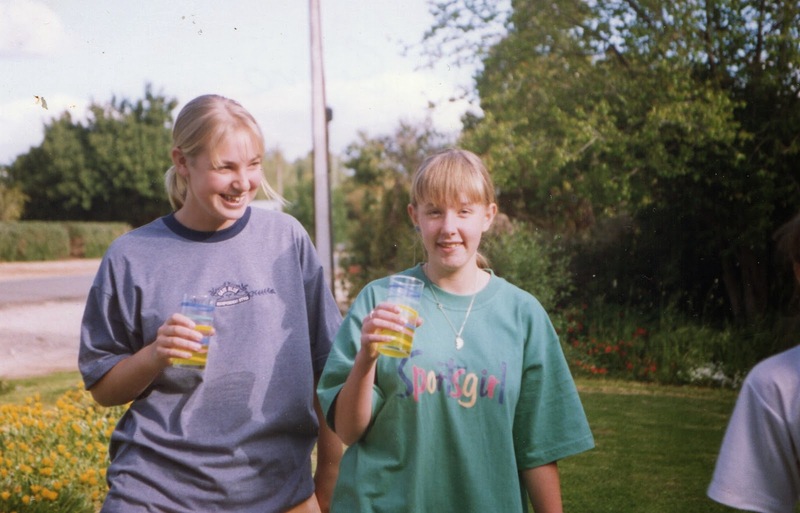 I am rocking the classic staple of any Australian girl's wardrobe in the 90s - the original Sportsgirl logo tee. Oversized, of course. You can also see the signature accessory, the half-moon Best Friend pendant of which I had several in a convuluted arrangement that worked across our group of friends. Could my fringe be any heavier? I think this is one of the last known documented appearances of my fully natural colour, untouched by Napro Live Colour sachets or Wella Colour Mousse. "Beware the Grenada Cherry!" I want to tell my younger self. I bet I have tartan shorts on too. Sadly there's no way of knowing.